Today only, Amazon has Lillebaby Carriers on sale for 35 to 52% off. There are 46 items to choose from. 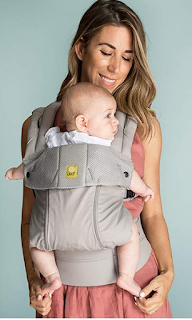 The best deal is the LÍLLÉbaby The Complete All Seasons SIX-Position, 360° Ergonomic Baby & Child Carrier on sale for $77 (regularly $159.99). Includes lumbar support, in 1 light-weight carrier with 6 ergonomic positions for “360 degree” carrying: rront: fetal, infant, outward & toddler; hip and back carry. The cheapest carrier is the LÍLLÉbaby Black Cotton Baby Carrier on sale for $63 (regularly $124.99). Comfortable, easy to use, versatile and a good long term investment. Secure. No strain on your back.